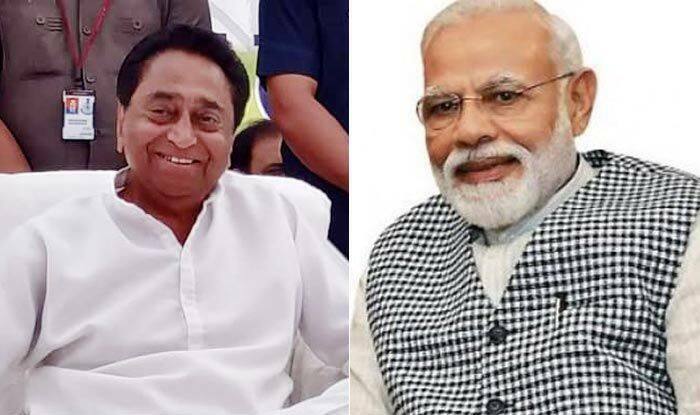 "Modi is scared and has forgotten the Vyapam Scam, e-tendering scam and several other such scams," Office of Kamal Nath on Tuesday hit out at the Prime Minister. New Delhi: After Prime Minister Narendra Modi on Tuesday termed Madhya Pradesh Chief Minister as ‘Bhrasht Nath’ while referring to the recent Income Tax (IT) raids, the CM’s office reacted saying that the PM was “overlooking” the scams during the Shivraj Singh Chouhan’s tenure. Further, the CMO also mounted attack on the BJP-led centre by terming the government as “corrupt in itself”. “Modi government is self-corrupt and no one can accuse Kamal Nath who is a parliamentarian for the past 10 years. Even Kailash Vijaywargiya was aware of these raids as they sponsored by the BJP,” the CMO added. Notably, PM Modi said in an exclusive interview to News-18 that “Bhrasht Nath (referring to Kamal Nath) could say anything, but it doesn’t matter. Action needs to be taken on scams and corruption. Scams were put in cold storage and we thought they should be probed. If the scams are surfacing, the people behind them should also come forward”. The IT department had on Sunday launched pre-dawn raids at 52 locations of people and associates linked to Nath by involving about 300 tax sleuths. Meanwhile, Kamal Nath’s officer on special duty (OSD) Praveen Kakkar today termed the raids as “political operation” and said that the IT officials couldn’t find anything “objectionable”. “Despite the 2-day long raid they didn’t find any document that they could seize, they didn’t recover any cash or jewellery either. They didn’t find anything objectionable, it was a political operation,” Praveen Kakkar told news agency ANI.